I'm happy that you stopped by because it's time for another "Challenge Me Monday"! This week our challenge for you at Fantabulous Cricut Challenge Blog is to create a project for your Mother, Grandmother, Aunt or other special lady in your life using her favorite color. * Flower and leaves - Cricut cartridge "Flower Shoppe"
* Spellbinders - "Lacy Ovals"
* Sentiment - My Pink Stamper "Happiest Moments"
Congrats to you Linda! Please use the "Contact Corner" at the top of my blog to send me your mailing address and I will get your cart in the mail to you! Ok, now it's your turn! First...hop over to FCCB and see what the fabulously talented Design Team has put together this week to inspire you. 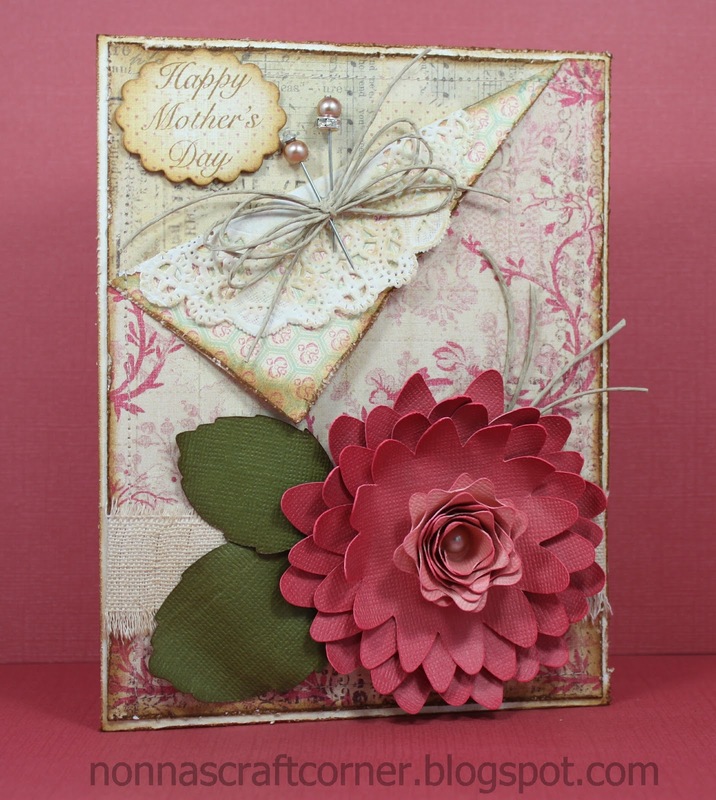 Then...go...get creative...and link up your Mother's Day project with us. I can't wait to see what you create! Oh, my goodness! I think this card is a gorgeous work of art! You have used so many techniques in such a small space! Fabulous! WOW!! This is beautiful!! I love the stitching, distressing and gorgeous flower!! 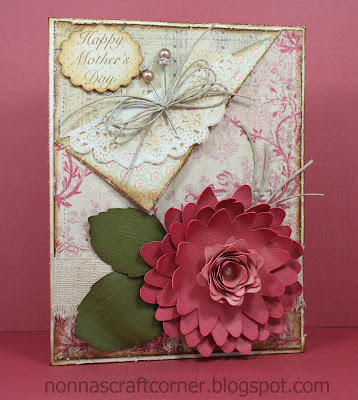 Beautiful vintage Mother's Day card:) I am SURE she will love it!! Nice job my friend! 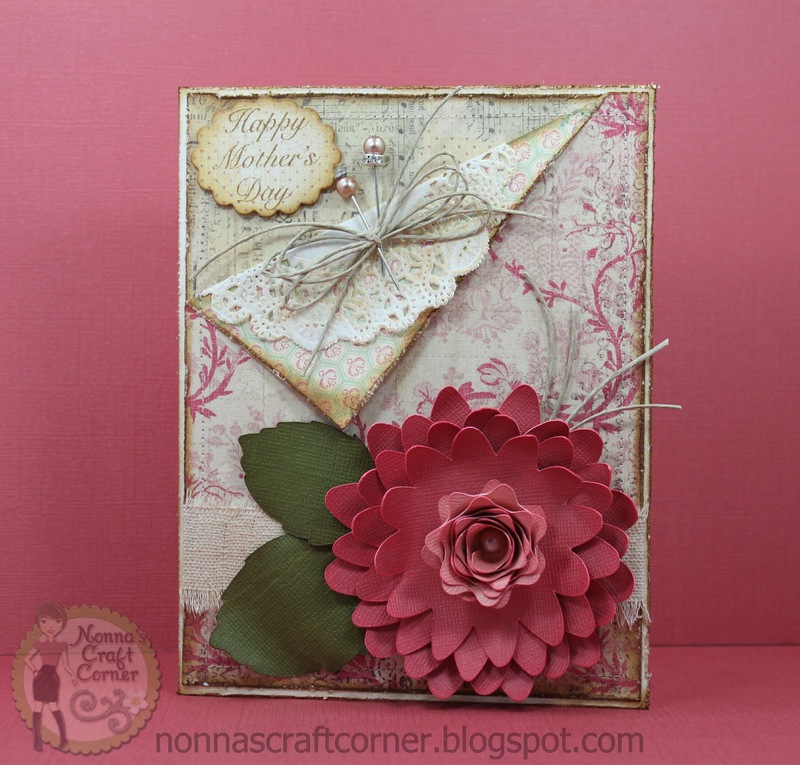 Beautiful card...I love the flower and details! Beautiful card! I think you "do" vintage very well! Vintage look? YOU NAILED IT :) I absolutely love this card! I love the pins, doily, everything! I just wanted to pop back and tell you thanks for sharing the idea of inking up Arya's foot or hand for on a card...love this idea! TFS!! A beautiful vintage card. The added stitching detail is just a great finish. Wow, this is gorgeous! The flower and paper is absolutely beautiful! Beautiful. You did a fabulous job on that! I love the flower. This is gorgeous, Tanya. I love the colors. Beautiful flower. Gorgeous card. Love the flower and the pins tied with the twine. So sweet, she will LOVE it! Hope you have a wonderful Mother's Day, our weekend is looking very full, as always! Oh My... This is STUNNING!!! That fold design on the top is so clever. I will have to try this! Very pretty card. Love all the detail. It looks like it took a long time to make. Your card is beautiful!! I just love all the distressing that you've done - and the folded top is such a lovely look! I'm sure your mother was delighted with her card!